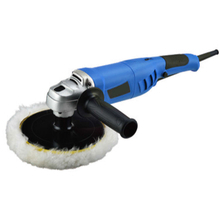 Polisher, Polisher Products, Polisher Manufacturers, Polisher Suppliers and Exporters - Dan Yang Three Win Industry Supply Co.,Ltd. - Using perfect solution for polishing, surface finishing, waxing and descaling. - Variable speed with eccentric diameter of 9mm for optimum applications. 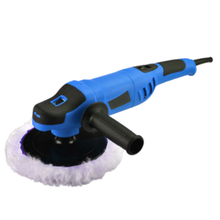 - Externally accessible brushes for greater serviceability and longer lifetime. - Soft grip for comfortable operation. 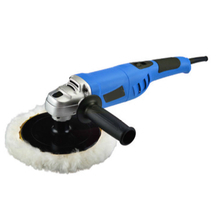 - 120W car polisher with Spone of 3 layers for better polishing result and longer lifetime. 1, Using perfect solution for polishing, surface finishing, waxing and descaling. 2, Variable speed with eccentric diameter of 9mm for optimum applications. 3, Externally accessible brushes for greater serviceability and longer lifetime. 4, Soft grip for comfortable operation. 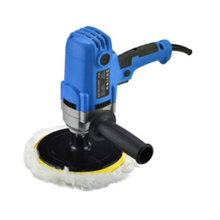 5, 120W car polisher with Spone of 3 layers for better polishing result and longer lifetime. - Two polishing heads with eccentric diameter of 9mm realice higher efficiency and better polishing results. 5, Two polishing heads with eccentric diameter of 9mm realice higher efficiency and better polishing results. - Soft start prevents uncontrolled start while constant speed control ensures the constant speed even the machine loading is changed. - Using perfect solution for polishing paint work, surface finishing, waxing and descaling. 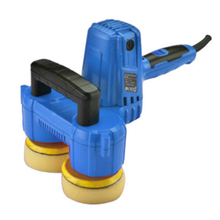 - Spindle-lock functions for easy changing of polishing pad. - Front "D" handle for user comfort. - Constant speed function: infinitely variable speed between 0-3000 RPM. ensures work at the right speed. - Ergonomic design with soft grip provides comfortable operation. Infinitely variable speed control. 1, Soft start prevents uncontrolled start while constant speed control ensures the constant speed even the machine loading is changed. 2, Using perfect solution for polishing paint work, surface finishing, waxing and descaling. 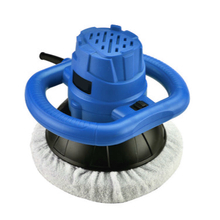 3, Spindle-lock functions for easy changing of polishing pad. 4, Front "D" handle for user comfort. 5, Constant speed function: infinitely variable speed between 0-3000 RPM. ensures work at the right speed. 6, Ergonomic design with soft grip provides comfortable operation. Infinitely variable speed control. - Constant speed function: infinitely variable speed between 600-3000 RPM. ensures work at the right speed. 5, Constant speed function: infinitely variable speed between 600-3000 RPM. ensures work at the right speed. 7, With LED display that makes it easy to read the speed. - With LED display that makes it easy to read the speed. - Constant speed function: infinitely variable speed between 600-3300 RPM. ensures work at the right speed. 5, Constant speed function: infinitely variable speed between 600-3300 RPM. ensures work at the right speed. 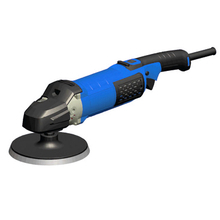 Vertical polisher with constant speed control and smooth soft start-up for high performance purposes. Using perfect solution for polishing paint work, surface finishing, waxing and descaling. 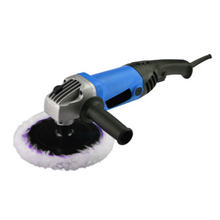 1, Vertical polisher with constant speed control and smooth soft start-up for high performance purposes.